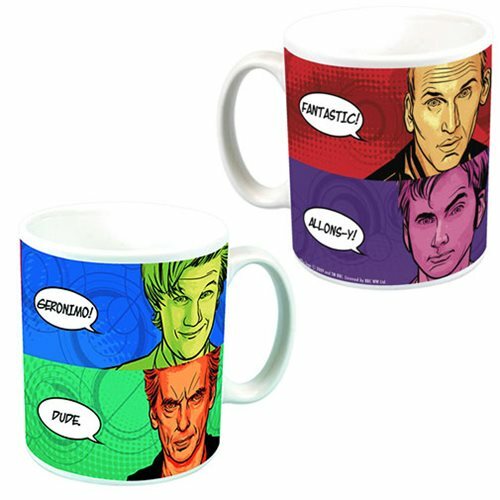 Shopping for Doctor Who Mugs? Take a look at our huge selection of Action Figures, Pop! Vinyl Figures, Statues, Mini-Figures, Construction Toys, and Key Chains! "Geronimo!" Enjoy the memorable catchphrases of Doctors Nine, Ten, Eleven, and Twelve from BBC America's hit series Doctor Who with this ceramic mug. Kickstart your morning with 12 ounces of liquid with this Doctor Who Four Doctor's Catchphrases Mug - Previews Exclusive. Measures about 4-inches tall.